China Mobile, the largest wireless carrier in the world, will begin accepting preorders for Apple's iPhone this Thursday ahead of a formal launch later this month, according to a new report. An unnamed representative for China Mobile confirmed to The Wall Street Journal on Monday that the carrier will begin taking preorders from customers later this week. It's expected that the iPhone will officially launch on China Mobile Dec. 18. The carrier began taking preorders for smartphones with 4G LTE high-speed connectivity on Monday. Though the iPhone 5s was originally shown on the company's site, users could only preorder devices from companies like Samsung and Lenovo. The representative who confirmed that iPhone preorders will begin on Thursday indicated that the company's customer services team has not yet been provided details on pricing plans for Apple's smartphone lineup. Expectations of a Dec. 18 launch have persisted for weeks, though China Mobile itself attempted to pour cold water on those reports last week, when the carrier denied that a deal with Apple had been finalized. Instead, China Mobile insisted that talks with Apple were ongoing. Anticipation of a deal between Apple and China Mobile has been high, particularly among investors, as the carrier boasts some 759 million subscribers, making it the largest wireless provider in the world. 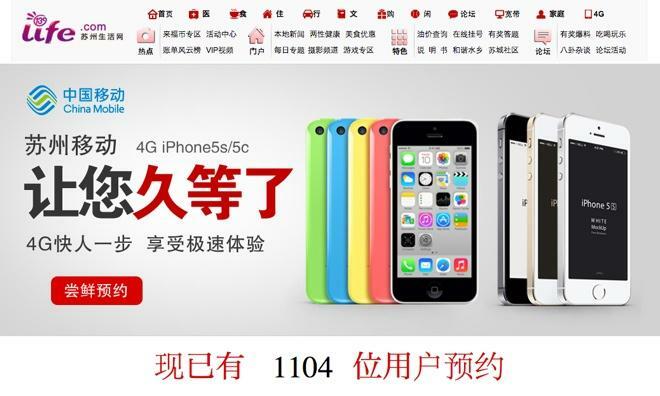 China Mobile is gearing up to launch its 4G TD-LTE network later this month, and Apple's new iPhone 5c and iPhone 5s are both expected to sport compatibility. Analysts believe availability of the iPhone through China Mobile will add $10 billion in revenue to Apple's bottom line in calendar 2014. It's been predicted that China Mobile customers could buy an additional 17 million iPhones next year, representing about 10 percent of the current smartphone install base at the carrier.